The information presented on this page was originally released on November 26, 2013. It may not be outdated, but please search our site for more current information. If you plan to quote or reference this information in a publication, please check with the Extension specialist or author before proceeding. MISSISSIPPI STATE -- Building a habit of learning by doing is beginning early for some Oktibbeha County students. Middle- and high-school students enrolled in the Studio School project founded by Mississippi State University professor Kay Brocato are serving as volunteer instructors with Body Walk, a hands-on exhibit that tours the state. Sponsored by the MSU Extension Service, Body Walk teaches elementary students about healthy habits, hygienic practices and the science behind the human body. 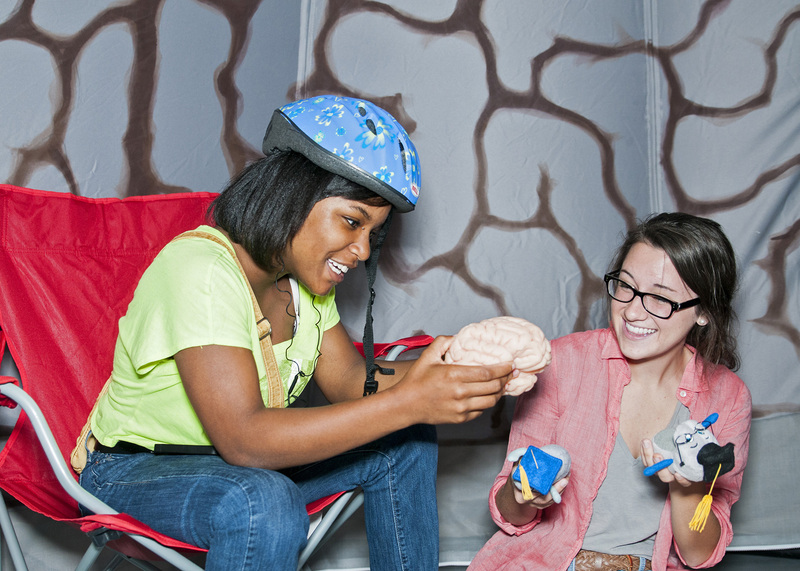 Ashley Fondren, coordinator of the MSU Office of Nutrition Education, said the Body Walk is a larger-than-life exhibit of the human body that allows students to travel through a simulation of the route food takes through the body. Brocato was able to incorporate the Body Walk experience into Studio School curricula for various ages because of a grant from the MSU Center for the Advancement of Service-Learning, or CASLE. She said Body Walk is a great service-learning opportunity because the student volunteers expand their own knowledge on the subject as they teach younger children. Brocato said Studio School began in 2008 and offers studio-based tutoring during and after school hours, as well as a summer program for students in fifth through 12th grades to supplement coursework. Brocato said the school’s long-term goal is to create a stand-alone four-year high school program that will grant diplomas. Brocato said Studio School is a good fit with CASLE because both programs seek to advance service-learning. While BodyWalk is provided free of charge by the MSU Extension Service, grant funds were used to pay for Studio School students’ transportation expenses to practice their teaching roles, Brocato said. Funds were also used to support research related to the experience and travel to present research findings. For more information about CASLE, visit http://servicelearning.msstate.edu/. To learn more about Studio School, visit http://www.studio-school.msstate.edu/.